For those of you who don’t know, something extra special is happening this Oktoberfest season. Backyard Oktoberfest’s own Scott and Jessica will be getting married. After we tie the knot this September, we’re heading over to Europe to experience all the wonders of Munich’s 216th Oktoberfest - and maybe check out Dublin’s Oktoberfest while we’re in the neighborhood. Our wedding and subsequent travels will be an exciting time for us, but unfortunately it means that we’re going to miss out on some of our favorite local Oktoberfest events this year. Thankfully, we were still able to honor our long-held tradition of starting the season with Schwaben Verein’s Oktoberfest in August. 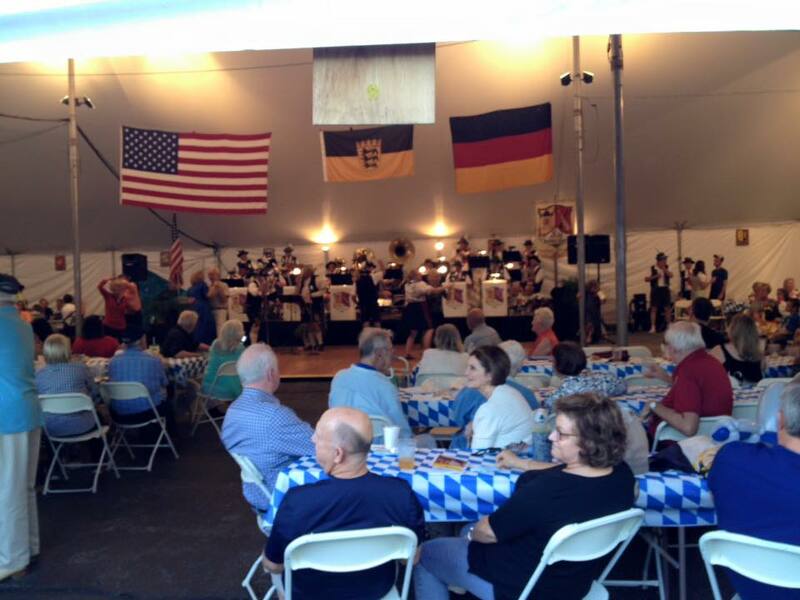 Last Saturday, we popped over to the Schwaben Center in Buffalo Grove for some traditional German fare. By the time we crossed the street from the free parking lot and paid our $10 apiece entry fee, Oktoberfest in August was already in full swing. It was a beautiful, cool evening, and local German-Americans and German-Aficionados alike were crowded into the large tent enjoying the music from the Freistadt Alta Kameraden Band. We grabbed some food and beer and got ready to get our oompah on. As has been the case for the past few years, our feelings about the food and beverage selections available at Oktoberfest in August are mixed. We’re big fans of the beer. Anytime we can get a pitcher of Hofbräuhaus München for $14, we’re pretty happy about it. We were also excited to see Dunkel on tap. Even though we never actually got around to ordering any, we were glad to see another German beer option that you can’t find at your local sports pub. Other beverages offerings included Miller Lite, Jagermeister, both red and white wines, and of course water and soft drinks. As usual, we stuck to the Hofbräuhaus München, and we were not disappointed. We were less thrilled by our food choices, however. We do not come into Oktoberfest in August with high hopes for culinary greatness. That’s not the goal of this event. But we have to report that the food we ordered this year was just okay. To be fair, the nature of the outdoor event space at the Schwaben Center makes food preparation tricky and keeping food warm difficult - especially on a cool night that felt more like autumn than the height of summer. Unfortunately this meant that our pretzels ($2) and Thueringer sandwiches ($7) were cold. We ate them anyway, but the temperature did not help the already bland sausage and dry bun. Mustard helped, but not much. Still, as we snacked on Landjaeger ($3) and apple cake ($4), we had to admit that we were satisfied and ready for some dancing. Above all, our favorite thing about this event is the community feel. None of our friends could attend the event with us this year, but it didn’t matter because everyone is friends at Oktoberfest in August. From the friendly vendors to the enthusiastic crowd, the interactions between people of all ages makes this feels like a block party. In fact, this year, that community spirit led to a surprise encounter for us. As we stood off to the side of the tent, simultaneously watching the band and the balloon artist, we heard, “Hey, aren’t you Backyard Oktoberfest?” Indeed, we are, so we said hello and ended up having a nice chat with a man who is set to host his own backyard Oktoberfest this year. It was a highlight of our night. So, if you spot us at your local Oktoberfest, don’t be shy. Come and say hello. That’s one of the best things about Oktoberfest. Even if you go in by yourself, you leave with new friends and great memories. Thanks for the new memories, Oktoberfest in August. We’ll see you next year.